As with our physical store, our online store is closed on Sundays. Please feel free to browse. 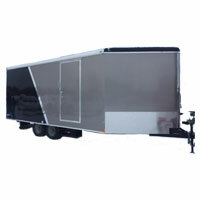 Country Blacksmith is your premier trailer dealer for enclosed cargo trailers! Hundreds of units for sale! We have years of experience with enclosed cargo trailers and their applications and will help you make the most informed decision when investing in a new enclosed cargo or enclosed car trailer! We offer our Enclosed Cargo Trailers online and at our Mount Vernon 618-242-0800 and Carterville, 618-985-8800 Illinois stores! SALE PENDING! CALL FOR AVAILABILITY. Website Hosted & Designed by NetSource Technologies Inc.